How do I create or sign into a SwiftKey Account? How do I find my SwiftKey Account ID number? How does a SwiftKey Account work with a new phone or device? How do I change the account linked to my SwiftKey Account? How do I delete my SwiftKey Account? Is my data secure with a SwiftKey Account? The SwiftKey Account is a free service that enhances SwiftKey Keyboard by leveraging the power of the cloud. Personalization: Get better predictions by letting SwiftKey learn from the way you type on a range of social networks. This improves SwiftKey Keyboard's accuracy as the app understands the words and phrases that matter to you. Backup & Sync: Your SwiftKey Account safely stores your learned language data and syncs it across your devices. If you lose your phone or get a new one, you won’t need to retrain the keyboard - signing into your SwiftKey Account will bring all your personalized insights right back. Themes: With the SwiftKey Account, you have access to free themes to change the appearance of your keyboard. Theme downloads are tied to your Account, meaning they stay secure and you can use them across all of your devices. SwiftKey Stats: A lowdown on the different subjects you type about the most, the emoji you use most often, and how many words SwiftKey learned from you. To sign up, all you need is a Google email address or Microsoft Account. 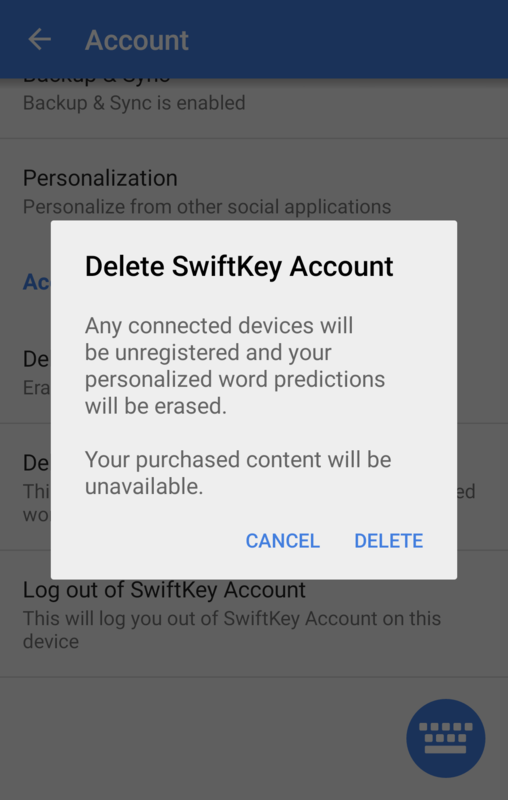 There is the option to create a SwiftKey Account as part of the installation process. After completing the first three steps of the installer, you will be given the option to create a SwiftKey Account. Follow the onscreen instructions to complete this process. If you don’t wish to sign up at this stage, just choose ‘Not now’. You can always sign up later from within SwiftKey settings. 3 - How do I view my SwiftKey Account ID number? To find your SwiftKey Account ID, please follow the steps below. You'll see your Account ID appear, and the option to copy it. You can then paste this into an email. 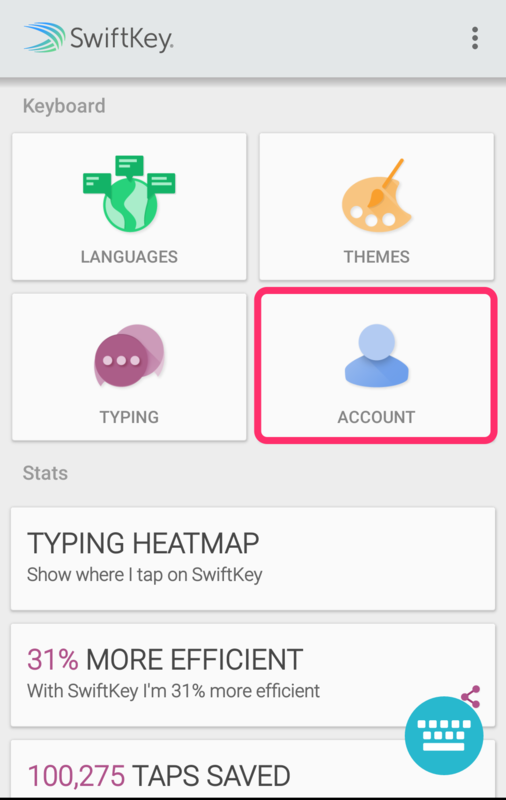 4 - How does a SwiftKey Account work with a new phone or device? The SwiftKey Account works to seamlessly sync your personal language model as well as all your themes. You just need to sign into your SwiftKey Account using your Google Account details. 5 - How do I change the account linked to my SwiftKey Account? 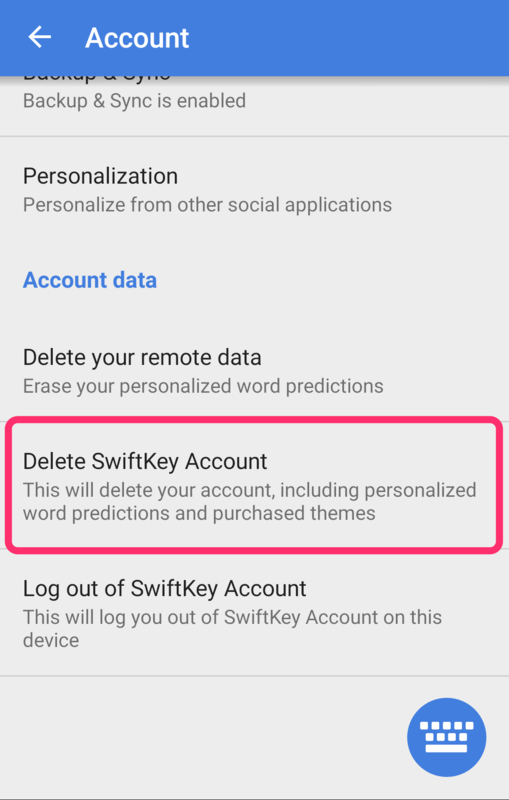 6 - How do I delete my SwiftKey Account? Please note that this will unregister all of your connected devices, and also delete your backed-up data from your SwiftKey Account. 7 - Is my data secure with a SwiftKey Account? We take our users’ privacy very seriously and ensure your data is protected and safely stored.